If you stream music, then you're probably already aware that Spotify is one of the top on-demand music services out there. It hosts millions of songs which can be streamed to a wide range of devices. However, with all the focus on music have you ever thought about looking for non-music content? It's there on Spotify waiting to be discovered. When we talk about non-music, the first thing most people think of is probably audiobooks. Most people are familiar with download services like the iTunes Store or Amazon Prime as sources for finding and listening to audiobooks. So, is Spotify really a place you should be looking? The answer is most definitely a yes. Spotify doesn't exactly hide audiobook content, but finding it is a quick click on a category or "mood" as it is with music. There isn't a dedicated section such as audiobooks or spoken word that neatly and conveniently collects all of that type of content that might be available on Spotify. The way to find it is to use the service's search facility. 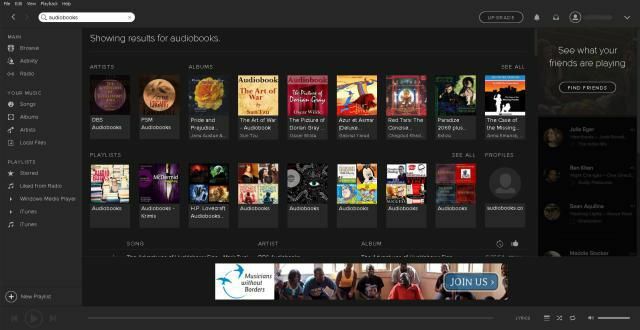 Here we'll highlight ways to effectively use the search function on Spotify to locate different types of non-music audio, including audiobooks, drama series, comedy, and other types of recordings. When searching for non-music content on Spotify, there are keywords you can type into Spotify's search box that will deliver useful results. When performing a search, don't forget to also consider playlists that you come across, too. There are a lot of playlists that people have created on Spotify, some of which are based on audio recordings. They can save you a lot of search effort because someone has already done the finger-work to find it. Simply typing the word "audiobooks" into Spotify's search can yield decent results. You might see classics literature like "The Adventures of Huckleberry Finn," "Around The World in 80 Days," and a host of others you'll probably remember from high school reading lists. This is a great way to browse and rediscover a book you've always wanted to read but haven't gotten around to. If you're looking for a specific title, then it's obviously quicker to find what you're looking for by typing in its title. For instance, searching for "War of The Worlds" brings up not only the version by Jeff Wayne (narrated by Richard Burton), but also the original 1938 broadcast featuring the voice of Orson Welles. How cool is that? The best way to search for dramas is to use specific titles. You may also have to append the word "drama" or "series" to get meaningful results. For example, typing in "Twilight Zone drama" or "Blake's 7 series" will all display fairly accurate results. There's a good selection of comedy on Spotify. Again, it's best to be specific if you can. If you've got a comedian in mind, search for their name. Otherwise, typing in the word "comedy" can produce a reasonable list you can whittle down to what you're seeking. There are probably others not listed here, so experiment!